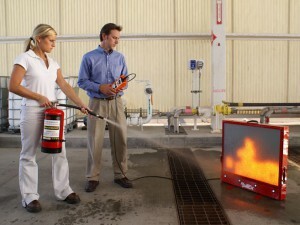 If your business has more than ten employees, they are going to need annual fire safety training. Some businesses rush to the least expensive program that will satisfy OSHA requirements, assuming that all training is the same; however, that’s simply not true. Fire safety training can vary in quality based on a number of factors, and many come with “hidden” fees that you may not be aware of. So what should you look for? Here are some important questions to ask before you book the training company. 1. What kind of course would you recommend? The course you need for your company should address the most probable emergencies that can occur at your facility. A training company worth its salt will tailor the course to your needs, surveying your business ahead of time to determine the most important content needed for your employees. 2. Who is teaching the course? Make sure the instructors are experienced professionals who know what real emergencies are like and how they occur. It’s even better if the instructor has experience with real-life emergencies. Nothing compares to the knowledge of a first responder who has faced countless fires and hazardous events. They can share personal stories, anecdotes and examples related to the training, which can make the class more interesting. 3. What will the course cover? Basic training courses cover how to use the fire extinguisher, but the most important thing employees should learn is WHEN to use the fire extinguisher. A good training course will focus on the importance of making fast and accurate, life-or-death decisions. Not only should your employees know how to fight fires, but also WHEN to fight the fire, and most importantly, when not to fight the fire. Evacuating and leaving it to the professionals is sometimes the best decision an employee can make. 4. Where will the training take place? Many fire safety trainings are performed outdoors, with a live burn in a pan that employees practice extinguishing. Although exciting, putting out a pan fire in a parking lot does not accurately simulate a realistic fire or emergency situation! Also, elements of the weather such as wind can affect the fire and unrealistically hamper the efforts of the employee trying to learn proper extinguishing techniques. It is much more effective to practice emergency procedures where they actually occur—inside the facility. With the help of digital technology, your employees can learn to extinguish the exact type of fire they would most likely face right at their worksite. This “on-the-spot” training also helps employees develop realistic evacuation plans and teach them to work as a team in an emergency situation. 5. Will there be extra costs involved with the equipment or the course materials? If the trainer is using “live burns”, or actual fires to practice extinguishing, you will need to have a burn permit and may incur any associated costs with setting up an outdoor space needed for the demonstration. If the training company uses your fire equipment for a live burn session, you will have to recharge them. You may not have budgeted for this unexpected, volatile cost, and it will vary based on how many turns each participant receives to extinguish the fire. The fire safety courses offered by Total Fire & Safety use high-tech, virtual simulators to practice extinguishing fires, which are versatile and allow more practice for each participant. These simulators feature virtual fire on a screen that responds realistically to the participant’s motions with the fire extinguisher. The indoor training gives each person multiple attempts with a full extinguisher every time until they feel confident with their firefighting skill. Compared to outdoor training, simulated training is more cost effective, accurate, completely green, and requires no messy clean-up or permit fees. So before booking a company to perform fire safety training for your employees, ask these questions to make sure you receive your money’s worth for your employees and your business. No one can predict how an emergency will unfold, but the right training company can make sure your employees are not only prepared to fight a fire, but are adept at making quick decisions about whether or not it is safe to do so. For more information, contact the professionals at Total Fire & Safety at 630-960-5060.